See the EDS documentation for more information about using this external. The Creating an EDS External article demonstrates the different ways in which the Hermes Python Console external can be used to test and debug Python-based externals. Download the Hermes Python Console external, including source code. You must have Hermes II 3.5.10b3 or greater and a PowerPC machine to run this external. Click here to browse the latest version of the Python source using your web browser. 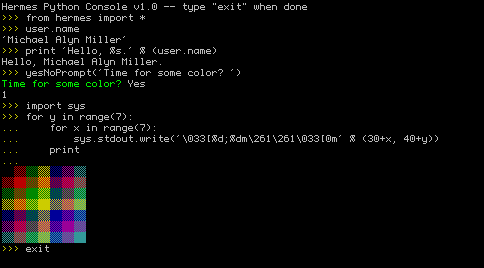 The Hermes Python Console external and its source code is made available under the three-clause BSD license.